This 2003 Game Boy Advance release feels like a fitting end to Harvest Moon's first act—one that's still intensely playable today. With around 25 installments over the last two decades, it's hard for newcomers to know exactly where to start with Natsume's Harvest Moon series. Sure, conventional wisdom implies picking up the latest game is probably your best bet—after all, a series devoted to such a specific idea has probably only gotten better over time, right? Well, it's a little more complicated than that. Harvest Moon games followed a pretty predictable trajectory until sometime around the PS2 era, when its developers seemingly started from scratch every time planning began for a new sequel. And while this kind of experimentation led to some wildly different experiences, some of the less successful attempts had me pining for the first five years of Harvest Moon, when each installment thoughtfully built off of what came before it. Unless you played each successive sequel upon release, it might be hard to understand Harvest Moon's evolution, so allow me to spell it out for you. 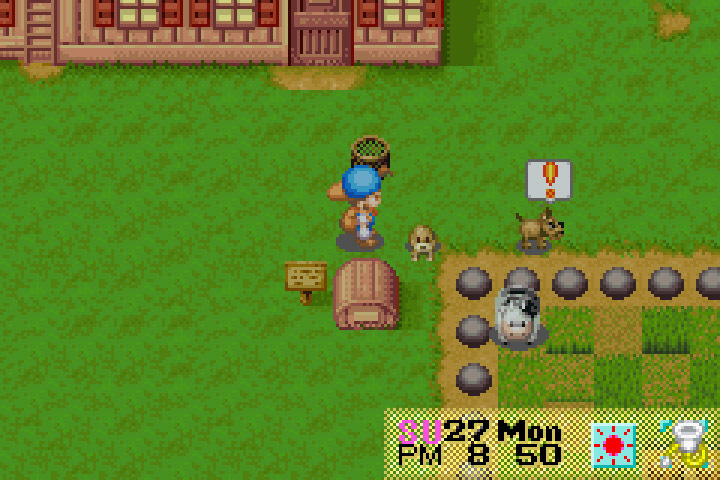 1996 gave us the first Harvest Moon for the Super Nintendo, which, in retrospect, feels like a prototype for what Natsume's farm sim would later become. Based on creator Yasuhiro Wada's GDC presentation from a few years back, it's evident that development mostly focused on getting things working, leaving not much time to figure out how they could work better—having to brush, feed, talk to, and milk eight cows every morning (should you decide to raise livestock) leans a little too close to the drudgery of actual chores. Today's Wii U Virtual Console release of the Game Boy Advance's Harvest Moon: Friends of Mineral Town couldn't have come at a better time—just a handful of days after Natsume's announcement of a new, retro-style installment in the series. 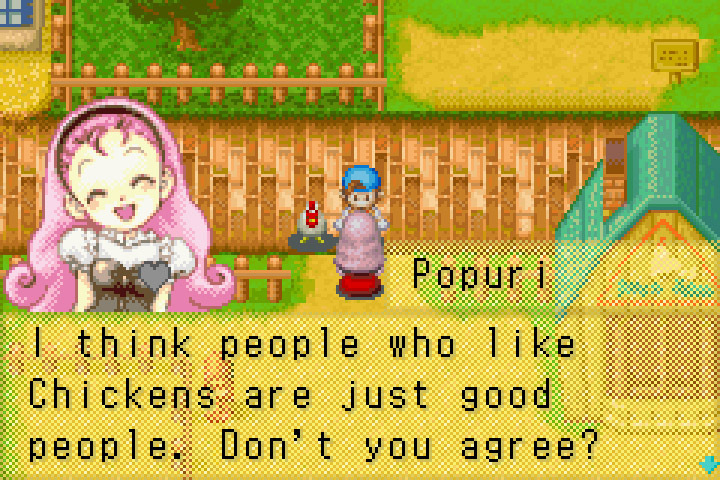 And that's because Friends of Mineral Town is simply the best possible expression of classic Harvest Moon. It features the same addictive loop of hard work and rewards that makes every entry in the series worth a shot, along with all of the farming and livestock options accumulated up to that point—but with a sense of freedom Harvest Moon has been lacking over the last decade. Loading it up today—and with some recent Harvest Moon experience under my belt—I was kind of shocked by how quickly Friends of Mineral Town cuts to the chase. Of course, it's necessary to gripe about every Virtual Console release (and a Retronauts tradition! ), and Harvest Moon: Friends of Mineral Town certainly doesn't escape my wrath. If anything, FoMT stands as the perfect portable experience, one that's great for keeping your hands and mind busy while watching Netflix or listening to podcasts. And while the Wii U's GamePad is essentially a portable screen, I'm a little baffled as to why Natsume didn't choose the 3DS as the platform for this release—an issue that would definitely be solved by cross-platform play. And while I love blowing up GBA games on my HDTV, Friends of Mineral Town's muted palette—designed for the first Game Boy Advance model—doesn't make for a great big-screen experience. To make things worse, since the game was designed with a 240 by 160 resolution screen in mind, the text looks more like a vision test chart than something you'd find in a video game. It's not quite as bad on the GamePad, but having to repeatedly scan my eyes back and forth across these letters spaced far apart from each other actually began to strain my eyes after a bit. Still, you shouldn't let these minor complaints get in between you and Friends of Mineral Town. Whenever people ask why I love this series so much, this is typically the game I point to—though I still have a soft spot for Back to Nature. And, honestly, if Natsume wanted to return to their old style and use this as the basis of the upcoming sequel, I'd be on board immediately. Even 12 years later, this doesn't feel like a particularly old game—to me, it's more like the most complete Harvest Moon experience. It could use a bit of modernization here and there—and the choice to play as either a boy or a girl—but I honestly can't think of an expression of Harvest Moon that works better. If you're wondering what this whole "Harvest Moon" thing is about, or were chased away by the tedium of later entries, Friends of Mineral Town could very well convert you. Tagged with 2003,	Game Boy Advance,	harvest moon,	Harvest Moon: Friends of Mineral Town,	Natsume,	Nintendo,	Retrospective,	USgamer,	virtual console,	virtual spotlight,	Wii U.